Speer & Hitler, or to give it its first UK DVD title, Speer & Hitler: The Devil's Architect (original title Speer und er) is a multi-award winning three-part German docudrama that tears open the veil of myths and half-truths obscuring a central figure of the Nazi regime, Albert Speer. Speer & Hitler: The Devil's Architect sheds light on a man of profound contradictions. Speer was a cultivated intellectual who aligned himself with the 20th century's most horrifying embodiment of evil. A brilliant architect, he built ostentatious monuments and controlled Germany's wartime industry, but in Hitler's final months, Speer the protégé would turn against his master. Starring Sebastion Koch (Black Book, The Live Of Others) as Speer and Tobias Moretti as Adolf Hitler, the programme features rare archive and home film footage of the two men as well as interviews with Speer's children to provide a revealing portrait behind the portrayals of Hitler and his architect. 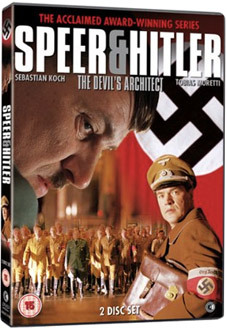 Speer & Hitler: The Devil's Architect will be released in the UK for the first time on DVD as a 2-disc set by Second Sight on 6th June 2011 at the RRP of £19.99. Also included will be a bonus feature: Epilogue: The Deception (88 mins).